Primers can be your skin’s best friend if you know how to use them properly and carefully. Primers are silicone or water based products which help in filling the pores and evening out the skin before you apply any base makeup. The result is an even finish which looks and photographs well. If you have large pores, your skin can look uneven even if you use the best foundation without using the best primer for large pores. If you are looking for some good products in this category, here are five best primers for large pores which will make your base look even and prevent breakouts also. There are also some tips and tricks listed in the end which will guide you to choose the best primer for your skin depending on its type and concern. This is a water-based foundation primer which will suit oily and combination skin. It contains water which helps to make the skin look radiant and fresh. The consistency of the product is thicker as compared to other primers available in the market. The oil absorbers present in the product give a matte appearance to the skin. This primer also contains vitamin C and peptides which make the skin look supple and help in collagen production. The primer is available in various sizes and is also available in travel size for you to carry it around with you on all occasions. It controls oil for up to 8 hours and does not contain paraben. This primer is suited to use with cream foundations. The product also comes in another version which contains Ivy but as it can be an irritant for some skin types, this neutral version is better suited as it works well for all types of skin and does not dry the skin too much. This is a great primer if you are looking for a dewy and healthy replenished skin. It seeps right into the skin and provides hydration. This formula contains coconut water which makes the skin look dewy and smooth. Ladies who have a dry skin will love this primer as it contains skin revivers which give a boost of hydration to the dry areas like cheek and nose area. You can also wear this primer on its own for a natural look and beneath cream or powder foundations also. It stays for long and is vegan friendly which is an added advantage. The coconut fragrance is soothing and calms the skin. This is also a water – based primer. It will work really well with liquid foundations but it is important to powder before using other types of foundations over this primer. For the eye area, use Too Faced Shadow Insurance which controls oil on the lids and keeps the eyeshadows looking vibrant. If you are looking for a primer which makes your skin look super smooth and even, then this is the right primer for you. It is lightweight and very silky so it glides on the skin to create a perfect base for your foundations. This primer controls pores to a large extent and gives an airbrushed look to the skin. Combine it with your liquid base makeup for getting a flawless skin in no time. It controls oil around the forehead and nose for around 4-5 hours and other areas for 7-8 hours. Keep in mind that this primer is suited for normal to combination skin and will not suit excessive oily skin. It also minimizes fine lines and wrinkles and is good for ageing skin. A small product is required for each time so a tube will last for long. The primer contains vitamin E which promotes skin health and makes it look soft. It comes with a slight tint which gives an even look to the skin. This is also a silicone based primer. Benefit products are quirky and have amazing quality and this is the reason why this primer is the preferred pore-controller for many people. 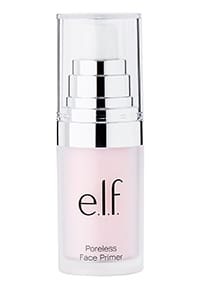 This primer contains light-diffusing particles which minimize flaws and make the skin appear flawless. The primer is silicone-based and suits all kinds of skin. It is also a budget-friendly primer and works as good as other high-end primer brands. The quantity of this product is also more compared to other brands. It dries to a matte finish and keeps the skin oil-free for a whole day. It does not provide much coverage but if you are looking for something which reduces the pores and controls shine, this primer is a great product if you have budget constraints.It has slight pink tones which control uneven skin tone and make the skin appear neutral. You can wear this primer alone or under a foundation as per your requirements. Go for dabbing method to make the primer sink into the skin otherwise, it will just sit on top of the skin and glide off as you progress through the day. This primer was launched with a powder foundation so it is specially suited for using with powder foundations. 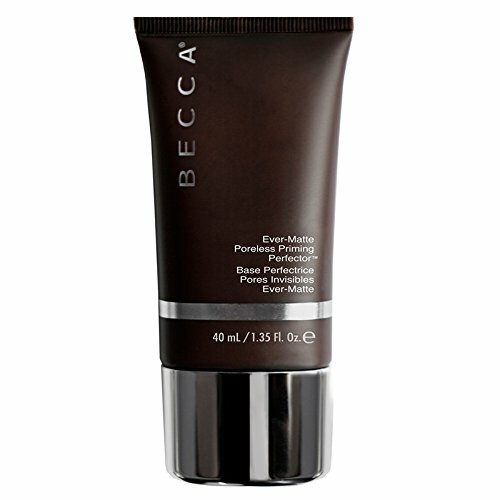 If you want to go for a light diffusing and oil controlling primer, Becca Evermatte Poreless Priming Perfector is made up of a trademark technology which helps to control sweat and oil. The primer dries to a matte finish and gives a smooth appearance without excess oil. The formula is free of silicones, oil, alcohol and fragrance. This primer is also perfect for acne prone skin as it keeps the skin dry and matte all day. Pat it gently on your skin and let it dry before continuing with your foundation so that it does not get mixed with the base makeup. It is important to warm up this primer with your fingers before usage to get the best results as it has a slightly thicker formula. It is also a great product for humid areas as it does not budge for 6-7 hours. If you have really oily skin, you just need to blot after 4-5 hours for a dry matte look. Combine it with Becca Ever Matte foundation for a flawless smooth skin which remains oil-free and matte for the whole day. Since it a power primer which takes its job seriously, your skin can look extremely dry if not moisturized properly before applying the primer. Always look for a product which suits your skin type. Primers come in many types and choose the one which is made for your skin type like oily, combination, dry, uneven, mature etc. Not all primers work for all skin types so it becomes important to choose the best one after you have tried many products. Moisturizing the skin before applying a primer is the most important step which will determine the performance of the primer. Choose a gel-based moisturizer if you have oily skin and a cream-based one if you have dry skin. Ladies with dry skin have to be more careful as primers make the skin look all the drier as they absorb all the oil. Wait for the moisturizer to get absorbed completely before you apply the primer. Pair up the foundation and primer thoughtfully as the same base products will work well together. Silicone primers should be used with cream and powder foundations and water-based primers should be used for liquid foundations. Buying an over-sized tube of primer might seem like a cheaper option but the primer is only required in a very small quantity and your tube will expire before it is used up completely. Go for small tubes which are travel-friendly and are great for touch-ups too. Always apply the primer with a patting motion rather than rubbing it into the skin. Rubbing will accumulate the product into the pores and clog them. A dabbing motion gives an airbrushed finish to the skin and tends to make the primer last longer. Also, do not keep on piling the product one layer over the other as primers do not show up much on the skin and will congeal if used too much. For a natural everyday look, use the primer on its own for a smooth even finish. For a more dramatic makeup look, apply primer on a clean moisturized skin and then go for the foundation which works well with the primer type. Apply a loose layer of powder over the foundation for a flawless matte look. If you do not want to use multiple products, buy a primer which is slightly tinted for an even finish. Primers which contain SPF eliminate the use of sunscreens also. Always use the sunscreen over the primer if you are using it separately as the sunscreen will not let the primer get absorbed into the skin if used first. Ladies with sensitive skin should avoid ingredients which can irritate the skin and damage it in the long run. Some primers contain natural extracts which can aggravate the skin concerns. Ingredients like water, coconut water, and vitamin E soothe the skin and a happy skin is a healthy skin. An illuminating makeup primer highlights the best areas of the skin while hiding skin concerns like fine lines, wrinkles, oiliness and large pores. They make the skin look bright also. Some other types of primers include skin-tightening primers, pore fillers, brightness enhancing primers etc which work on different skin concerns. Color correcting primers work best to target redness, dark spots and dark circles and can be used beneath concealers for some added color control. Use a combination of primers for different skin concerns for an even look. Yellow and violet toned primers conceal uneven skin and dark spots easily and make the skin look refined and radiant. So these are all the tips and tricks you need to follow for buying the best primer for your skin to use beneath your makeup and be the star of all the parties. Primers can really help to reduce pores and control oil on the face while making it look radiant and fresh. You will see the difference in staying power of makeup also once you start using the correct primer for your skin type. Try different products before you settle on the one which suits your skin in the best way and makes it look even and matte. You will love the finish of your skin with a primer and will never use foundation on its own ever again. The same primer is listed twice. ??? I have large pore so I’m not confident when I go out. Can you recommend good foundation primer for dry skin and large pores? In general, foundation doesn’t go deep into the skin layer. Applying a thin coverage of foundation and mattify the foundation to mineral power are the ways makeup artists do to hide flaws and lines on face. There are two types of primer you should know. First is Silicone-based primers which have a thick texture. 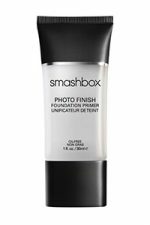 This primer works very well to hide large pores, lines, acne scars, and so on. Another is Water-based primers are weight lighter than Silicone-based primers. This types of primer is really good in blending with liquid. I have an oily skin so I’m worry about creasy. Are primers is good for the skin? Primer is a base for face makeup which makes facial skin smoother and stay longer. In general, there are 3 kinds of primer formula: gel, cream, and powder. Makeup artists indicates that primer is base to prepare your skin before putting moisturizer and foundation. Many makeup primers chooses silicone-based polymers like dimethicone due to their ultra-smoothing effects. But for some who have a problem with cystic acne and other conditions, I suggest you to check with a professional before buying because allergic reactions have been reported. Hello Angel. It’s very very cool! 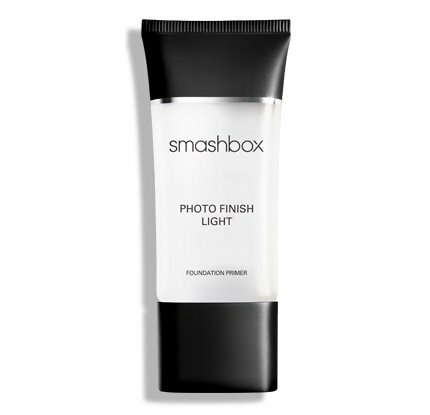 Smashbox Photo Finish Oil Free Primer. My makeup stays still longer. Why is Tatcha the silk canvas not among these primers?